Every few years, the MBTA publishes the Blue Book. It is a compendium of data, neatly packaged in a PDF format. (It would be nice if they published a Blue CSV, but that's asking a lot of a public transit agency.) I haven't had much time to play with it, but did download the data for the core subway lines, to compare 2013 to 2009 (the last Blue Book) and before. This shows data for each subway line (N.B. : it only shows subway boardings for the Green Line) for the past 25 years. 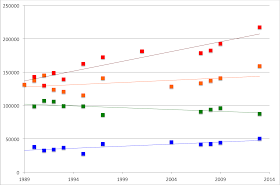 The Red, Orange and Blue lines all grew by 13% since 2009, and compared to their lowest count over the past quarter century, they are up 67%, 38% and 82%, respectively. All three lines saw their highest ridership in 2013. If the trains seem crowded, it's because they are carrying significantly more riders now than they were just a few years ago. Then there's the Green Line. It seems that ridership there is flat, but I haven't had a chance to look at the branches. It might be due to it's slow speeds, arduous boarding process, arcane rules, lack of traffic priority or a combination of these factors. Or it could be that it's already basically at capacity, at least as currently configured. I'll have more analysis—including station-by-station counts (very variable) and bus routes (they're growing)—in the coming days. And the long slow decline of commuter rail ridership continues. Since the 90s, it seems like the only growth has come from extensions, and even that has hit the point of diminishing returns. Also, the ridership at Plymouth is amazingly bad! It's in the same class as Hastings and Silver Hill, except they spent a lot more money on the Plymouth station. Plymouth gets basically no service. People there have decided to converge on Kingston instead. Both Kingston and Plymouth stations are badly located, but Kingston has parking. If Plymouth had decent walking access, and wasn't on an awkward branch, then it might not have tanked so hard that the MBTA decided to just cut it off mostly. Yeah, the Plymouth station is just terrible planning all around. There's a branch, so frequency gets split between it and Kingston no matter what, or else they have to use the even less satisfactory option of serving first one then the other with many reversals of direction. The station location combines the worst of both worlds: just a bit too far from the town center to reasonably walk, yet without enough parking or good highway access to make driving attractive. At this point, why do they even bother running any service there at all? It's all Boston-Kingston-Plymouth-Boston anyway, which just wastes time. The commuter rail simply isn't good enough, and the trend is that the people who care to take rail have been moving into the city, so I'm not surprised that the ridership is declining; roughly speaking declining since 2008. It's back to 1999 ridership levels. At least the MBTA is finally improving the tracks on the existing lines (a better investment than extensions). I wonder what ridership would be like with EMUs and a clockface schedule. Digging deeper into the commuter rail numbers, it's interesting to see where ridership is strongest. 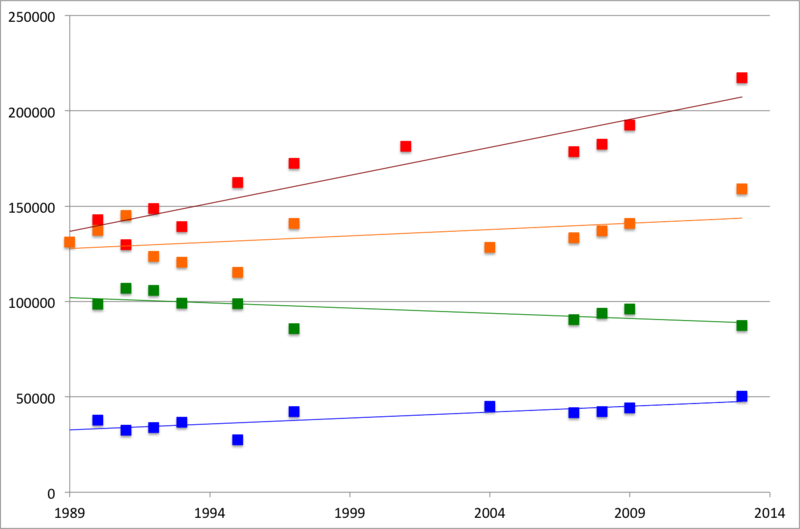 The patterns do not appear to be the same as they were in 1999. * The strongest line is clearly the Providence/Stoughton line, where all stations are doing pretty well. It can't be coincidental that it's also the fastest, can it? * After that, the strongest stations are Beverly and Salem on the Newburyport/Rockport line. * Next after that is Anderson on the Lowell line; Lowell and North Billerica are also strong. * Next strongest station is Worcester, then Framingham. The Worcester line generally does very well, with Southborough, West Natick, and Natick also being strong. Current improvements should be well worth it. * On the Middleboro/Lakeville Line, Bridgewater is strongest. And then there are a lot of much weaker stations getting weaker. Some of this is as it always was. But a bunch of it represents dramatic shifts in ridership; the large increase at Needham Heights is new in the last few years. Beverly and Salem have been gaining for a long time while all the other stations on the line decline. Notably, on most lines, most stations are losing ridership -- but a fairly small number of stations are booming. Ridership is becoming *less even*. Is this due to the introduction of express runs which bypass stations? Or, alternatively, is it the reason why MBTA introduced express runs which bypass stations (for instance, express to Salem, or express to Anderson)?